Our stock "To have and to hold and to keep your beer (or drink) cold" wedding koozie design will make any special day last forever. These unique wedding day coolies make great gifts to everyone for remembrance of your celebration. Just provide your Names and Date in the comments box during checkout and we will send you a sample via email of what it will look like. 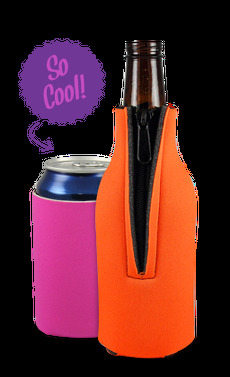 Made with 1/8" thick high density open cell foam, these wedding koozies are collapsible so they fold flat, fit in pockets, and go anywhere!